"But Eeva, Social Media takes up too much of my writing time!" If I had a penny for every time I heard this from an author, I can retire. Well... whine no more. 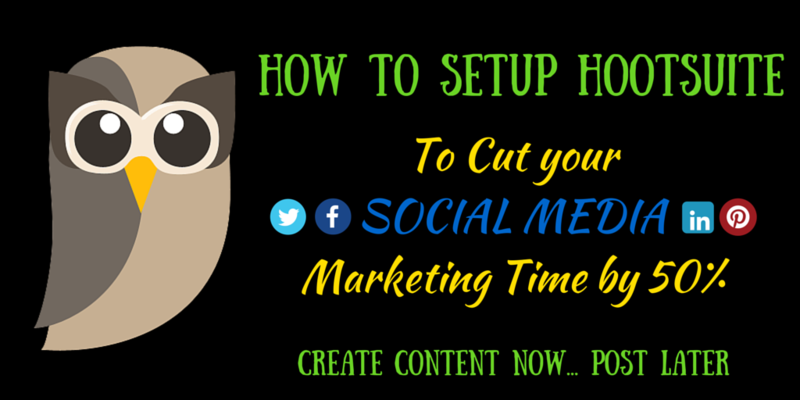 Hootsuite will cut your time on social media by half without sacrificing the quality of your content. No more excuses. In case you haven't heard of it yet, Hootsuite is a Social Media Management tool. 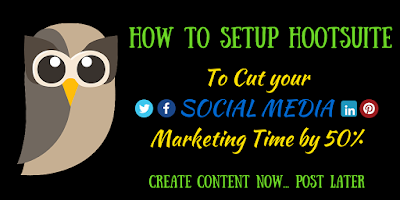 You can connect your Twitter account, Facebook account, Google Page, Linked In and manage your posts from your Hootsuite dashboard. This tool allows you to create your posts and share it whenever you want to - instead of having to go to the sites and posting separately. Even if you copy and paste your post content, it still takes too much time. Before, even with Hootsuite, I still composed tweets for Twitter, for the simple reason that when you send a draft post from Hootsuite, the image is converted to an owly link. It sends to Twitter but without an image, and that's just plain dull and boring. With the speed of posts on Twitterdom, how many people will take the time to click on your owly link to view the image? A reader's eyes will just move to a more engaging and eye catching tweet. Total Marketing Fail. But recently, Hootsuite added a feature, Alleluia! You can now compose a draft post, save it, and send it to your social media accounts with just 2 clicks - AND it will show the image itself instead of the owly link. Easy as pie. No need to repost over and over again until your eyes glaze over. 2 clicks... what more can you ask for? You can choose a FREE account or Hootsuite PRO. Up to you. The only difference that counts for authors is that with a PRO account, you can easily schedule tweets by bulk, by uploading an excel CSV file. A whole week's worth of posts if you want. Ok, here we go... don't want to hear excuses after this. Believe me, this is the answer to all your "no time to promote" woes. The little black owl really works, at no cost to you. **Once done, whenever you post, you can choose the social media site you'll post to. After adding your social networks, click on +Add Stream. On Twitter, adding a stream makes it easier for you to RT and monitor your lists. Do you want to see when your tweet gets RT'd? View the tweets of your group/lists? You can see how my stream looks like from my dashboard from the image below. All the tweets from my streams are displayed side by side. So convenient! Your followers will love you since it's now EASY for you to RT them... and you can monitor what's going on where it matters to you. This is the reason why Hootsuite is now my favorite. Good Job, Hootsuite Team! This new feature is a game changer. What's the point if there's nothing to look at?? On the upper left corner, click on your profile image. It will take you to My Social Networks. Hover your mouse pointer on your Twitter tab, you will see a cog wheel. That's it! Your tweets from Hootsuite will now be shown on Twitter with the actual image you attached, instead of just an owly link. If you have drafts that were saved before we changed your settings to show images, delete the owly link of the image on the draft posts and reattach the image. If it's a new account and you don't have drafts, write several for future use. When you add a link to your post, enter it in the small box that says "Add a Link" and shrink it. It will be converted to an owly link. Click on the paperclip icon and upload the image. Don't go over the 140 character limit. When you're done, click on SAVE and choose SAVE as DRAFT. What makes it so easy is that when you need to share your post, just hover your mouse pointer on the right end of the draft post and click on the pencil icon to Edit... and SEND. It warms my little heart. IMPORTANT NOTE: Whenever you share a draft post, make sure that you TICK the box next to "Retain Copy of Draft Message". Otherwise, the draft will be deleted when you send it. You can also schedule when your posts will be shared by clicking on the calendar icon. Even when you're going on vacation, the posts will be shared on schedule. You can schedule a post several times. So... not enough time to promote issue SOLVED. Now, if I still don't see your promotions on Twitter, it only means one thing. You don't want to sell your book through Social Media. That's a different problem altogether. For that, you need a different kind of coaching. For more Hootsuite features, you can check HERE. Related Articles: Self Promotion Is More Than Just "Buy My Book!"